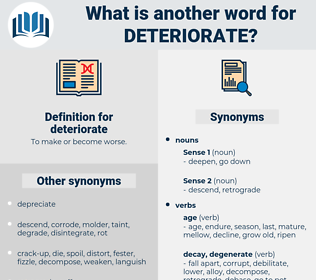 What is another word for deteriorate? 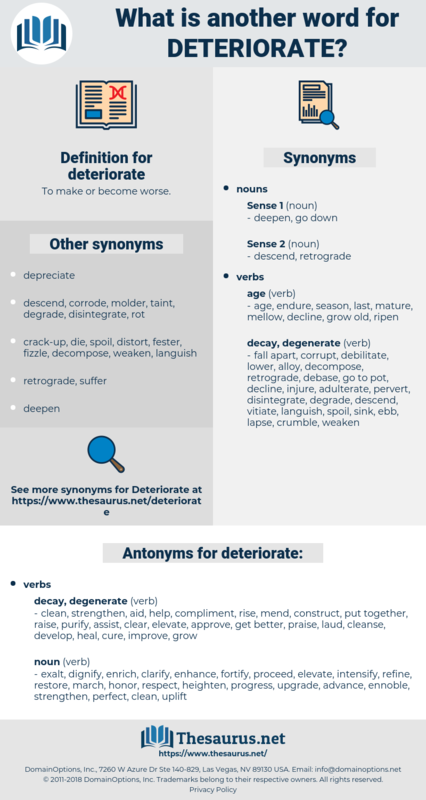 exacerbate, degenerate, escalate, erode, fester, decline, deepen, impair, suffer, grow, intensify, decrease, undermine, jeopardize, widen, fail. clean, strengthen, aid, help, compliment, rise, mend, construct, put together, raise, purify, assist, clear, elevate, approve, get better, praise, laud, cleanse, develop, heal, cure, improve, grow, join, fix, build, increase. fortify, refine, enrich, advance, intensify, perfect, clarify, progress, respect, march, uplift, restore, proceed, honor, heighten, exalt, upgrade, ennoble, dignify, enhance. die-hard, dart, dread, druid, diderot, draw out, dehydrated, derrida, dehydrate, dried-out, dooryard, dearth, derate, die hard, Drouth, dowered, death rate, dry-eyed, dried, dryad, dirt, deride, data rate, deathrate, de-aerate, dirty, dry-rot, deaerate, detroit, dry out, diehard, diorite, dorado, dard, dry rot, dreaded, dotard, do-or-die. wear off, wear, wear thin, go to the dogs, wear down, wear out, go to pot.